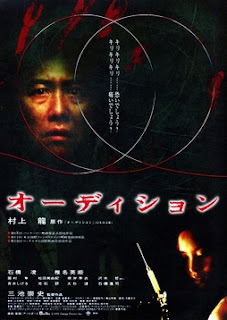 Tag line: "She always gets a part"
To say the last 1/3 of Takashi Miike’s extraordinary horror film Audition is tough to watch might be the understatement of the century. And a big reason why it’s so shocking is that the entire first hour of the movie (with one or two exceptions) plays like a drama / romance, in which a middle-aged man falls for a beautiful younger woman. But as he, and the audience, will discover, she is no ordinary lady, and it’s because this revelation comes so late in the game that the climactic sequence is as traumatic as it is (well, that and the copious amount of bloody violence). Shigeharu Aoyama (Ryo Ishibashi), an executive at a Japanese-based film production company, has been a widower for the last seven years. His teenage son Shigehiko (Tetsu Sawaki) gently reminds him that he’s not getting any younger, and should find himself a new wife. Unfortunately, Aoyama has been out of the dating loop for some time, and has no idea how to land a potential mate. In an effort to find Aoyama the perfect woman, his friend, movie producer Yoshikawa (Jun Kunimura), suggests that they hold mock auditions for a non-existent film, a plan that will surely lure dozens of pretty young ladies into their offices. Despite his initial reservations about deceiving so many women, Aoyama goes along with Yoshikawa’s scheme, and during the auditions he meets Asami Yamazaki (Eihi Shiina), a former ballerina who suffered a leg injury a while back that forced her to give up dancing. Though he’s physically attracted to her, Aoyama is even more impressed with Asami’s tenacity, and the brave manner in which she has dealt with adversity. Aoyama eventually asks Asami out on a date, and before long the two are an item. But Asami is not what she seems to be, and if Aoyama isn’t careful, his new girlfriend may just pull him down into the darkness that has already enveloped her soul. My good friend Jason Pyles, host of both Movie Podcast Weekly and the Horror Movie Podcast, has a saying that I’ve heard him repeat numerous times: “Horror happens to those who deserve it the least”. Nowhere is this sentiment more accurate than in Miike’s Audition. From the outset, it’s obvious that Aoyama, so well portrayed by Ryo Ishibashi, is a decent man; a loving father and a dedicated executive looking for a girl willing to spend the rest of her life with him. When he finally connects with the seemingly shy and unassuming Asami, we’re happy for Aoyama, and like him we ignore the warnings of Yoshikawa, who sees something in Asami that makes him… uncomfortable. Yoshikawa is so worried, in fact, that he begs his friend to take things slowly, advising that Aoyama not call Asami for a few days. Aoyama begrudgingly agrees, and it’s here that Miike reveals Asami’s true nature; during the days that Aoyama doesn’t call her, Asami sits on the floor of her near-vacant apartment, obsessively staring at the phone, as if willing it to ring. She remains perfectly still the entire time (though something else in her apartment does move, giving the film its first of many creepy moments). All at once, we know something about Asami that Aoyama does not, bringing an added level of tension to the ensuing scenes in which they appear together. All leading up, of course, to the film’s climax, and, boy, is it a doozy! Featuring flashbacks, dream sequences, alternate conversations, and lots of blood and gore, the final moments of Audition are, without question, among the most terrifying in modern horror. If you don’t believe me, see for yourself. But be prepared to squirm in your seat a little, and odds are you’ll cover your eyes once or twice before it’s over. Just rewatched this, and I agree, the last 1/3 of the film consists of some of the most brutal moments in cinema history. However, I don't see this in the realm of Jay's dictum. Yes, I sympathize with Aoyama, and the horror that happens to him isn't something I'd wish on anyone, but I see it as at least partly the result of his sexual objectification of women, which he tries to believe he escapes by his "nice guy" persona. And given Asami's past, I can't help but sympathize with her as well.